A Syrian-bound plane intercepted by Turkey was carrying Russian-made defence equipment destined for Syria's defence ministry, Turkish Prime Minister Recep Tayyip Erdogan has said. "One cannot carry defence industry equipment or arms, munitions... with civilian aircraft," Mr Erdogan said. "Unfortunately this rule was violated." An earlier translation quoted Mr Erdogan as saying "ammunition". Syria has accused Mr Erdogan of lying, saying the charge "lacks credibility". Turkish jets forced the plane, coming from Moscow, to land in Ankara. Both Damascus and Russia have denied the plane was carrying illegal cargo and accused Turkey of putting lives in danger. Tensions were already high between Turkey and Syria, following the deaths of five Turkish civilians by shelling from across the border last week. Turkey has returned fire, and on Wednesday its top military commander warned Ankara would respond with greater force if the shelling continued. In Syria itself, a huge explosion has hit near a state security building in the centre of the capital, Damascus. State media said two people had been injured in the attack, which it blamed on "terrorists". The Syrian Air Airbus A320, with about 30 passengers on board, was intercepted late on Wednesday by two Turkish fighters and escorted to the capital's Esenboga airport. Turkey said previously it had received an intelligence tip-off that it had illegal cargo on board. Speaking to reporters in Ankara, Mr Erdogan said: "What [a Russian state-run arms manufacturer] was sending to the Syrian Defence Ministry was: equipment, materials, munitions." "Relevant authorities are continuing their investigation." Initial translations quoted Mr Erdogan as saying "ammunition" rather than "munitions". Russia's state arms export agency Rosoboronexport had earlier said it had no information about the cargo and denied it had any connection with the flight or anything on board. Later on Thursday, Syria's foreign ministry said Mr Erdogan was lying "to justify his government's hostile attitude towards Syria". "The plane's cargo was documented in detail on the bill of lading and the plane did not carry any illegal material or any weapons," the ministry said according to Sana state news agency. Sana quoted Syria's information ministry as saying Mr Erdogan's comments "lack credibility and he must show the equipment and ammunition at least to his people". Early on Thursday the aircraft was allowed to leave Ankara after several hours on the ground, but Syria and Russia have reacted angrily to the incident. 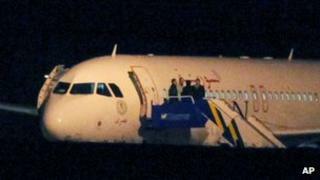 They said Turkey had put the passengers and crew in danger by using military aircraft to force it to land. Syrian Transport Minister Mahmoud Saeed accused Turkey of carrying out "air piracy" and breaking civil aviation agreements, according to Lebanon's al-Manar TV. Turkey has already imposed an arms embargo on Syria, and Foreign Minister Ahmet Davutoglu said it was determined to stop any transfer of weapons to Syria through its airspace. The foreign ministry said there was "no basis" for safety concerns and that "all measures were taken to ensure the safety of all passengers and to cater to their possible needs". Since the uprising against Syria President Bashar al-Assad began last year, Russia has repeatedly refused to abandon its support for Damascus, while Turkey has been a vocal critic of the Assad government. The BBC's James Reynolds, near the Syrian border in southern Turkey, says that despite taking opposite views, Ankara and Moscow have maintained a close relationship and continued to do business together. This incident could be the biggest test of their ties since the conflict broke out, he adds. In another sign of deteriorating relations, Turkish officials revealed on Thursday that Syria had stopped buying electricity from its neighbour last week.